All Trolleys are front loading and freely mobile. They are supplied in flat packs and ready to assemble. Assembly instructions and hardware/parts are included. . Hanging Modules are usually of 3mm flat powdercoated steel whilst castors are heavy duty in black. Trolleys provide lower cost per sheet filing than any other form of filing. The Trolleys are built for the rigours of construction sites yet are equally at home in architectural and design offices. Order a combination of Plan Trolleys and Plan Clamps from any of the Planmate brands listed in this category and save up to 25%. The Bundles are conveniently presented by brand and in order of plan trolley size. The wallmount bracket of each brand can hold all sizes plan clamps A0, B1, A1 and A2 individually or in mix of different sizes. Up to 91 built-in scales help you measure plans, blueprints, and maps for maximum versatility in architectural, engineering and civil/map scaling. Save up to 10 custom scales for calibrating out-of-scale plans and plan books. You can easily store a new scale permanently into the device for future use. Measure area, line and arc lengths of irregular shaped objects on plans and maps. All the big brands are presented in an online shopping portal concept to maximize comparison of similar items from the 5 biggest brands in Australia. A box of 10x A0 Universal BUDGET Clamps. The Universal BUDGET Clamp features a triple wing nut secur..
Universal BUDGET Plan Clamps feature a triple wing nut securing system for extra holding capacity. I.. 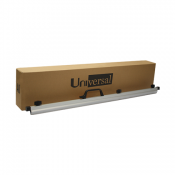 The Universal A1 MINI 12 Plan Trolley is the ideal solution for storing plans up to A1 size. T.. 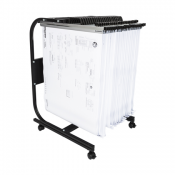 The Universal A1 MAXI 24 Plan Trolley is the ideal solution for storing plans up to A1 size. T..
our helpful Australia online store? Planmate offers the largest range of plan filing and storage products in Australia, as well as being the digital plan measuring tools specialist. We offer a range of Plan Clamps , mobile Plan Trolleys and Wall Racks from the major manufacturers of Plan Filing and Plan storage products.